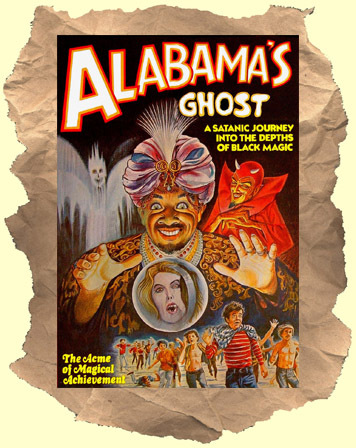 SYNOPSIS: Christopher Brooks gives an energetic performance as the rising magician "Alabama" who is treated like a rock star. He got all his tricks from the dead "Carter the Great" whose ghost still haunts him. A big promoter turns out to be a megalomaniac vampire planning to enslave a viewing audience with zeta rays (don't ask!). There's also a Nazi femme scientist ("Dr. Caligula") who builds a robot version of Alabama! This entertaining 70's film is full of weirdness, crazy camera angles and hippy vampires on motorcycles. You just have to see it to understand.